UNICEF Nederland is one of the 36 National Committees that represent UNICEF International, the charitable foundation that actively works to provide a better world for today’s children, particularly the most vulnerable. The Dutch Committee is responsible for raising funds that are implemented in 190 countries worldwide with the purpose of giving all children the opportunity to survive and develop. In addition, the Committee ensures that the Dutch Government adheres to the Convention on the Rights of the Child and is a co-founder of the Kinderrechtencollectief (Children’s Rights Collective), a coalition of children’s rights organizations. UNICEF, as a global organization, has an easily recognizable brand that carries with it a powerful reputation. Its brand informs its ethos, heritage and identity, as well as a huge amount of credibility, so it obviously has to be maintained on all corporate communications and marketing materials. A properly formatted email signature with the UNICEF branding was therefore a must so there would be no risk of harming this brand reputation. However, using Office 365 alone to manage signatures is not necessarily easy. It involves the creation of numerous Transport Rules and any signature design cannot be tested in advance. These limitations often make email signature management a chore for an IT department and can take up a lot time. 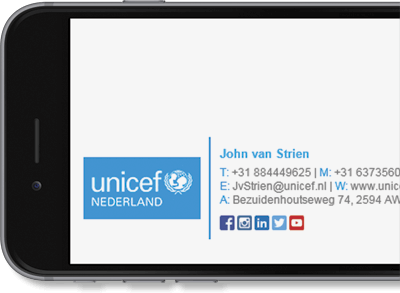 With this in mind, UNICEF Nederland wanted to find an Office 365 signature solution that would make this whole process easier and less time-consuming. “After reviewing all of the content on the Exclaimer website, we felt that this was exactly what we needed,” he said. “The sales process was very easy and we were able to implement Exclaimer Cloud - Signatures for Office 365 without any external assistance.” He was also offered a special charity discount, a standard practice by Exclaimer that he further appreciated.